– If you’re looking for a bar to watch the game at, try www.packerseverywhere.com. Packers Everywhere was created to let you know where you can gather with other Packers fans to watch games and have all kinds of other Packers-related fun. We know that the only thing you like more than watching Packers games is watching them with your fellow fans. – FOX Sports, now in its 19th season as an NFL network television partner, will broadcast the game to a national audience. – Play-by-play man Joe Buck and color analyst Troy Aikman will have the call from the broadcast booth with Pam Oliver and Erin Andrews reporting from the sidelines. – Milwaukee’s WTMJ (620 AM), airing Green Bay games since 1929, heads up the 53-station Packers Radio Network, with Wayne Larrivee (play-by-play) and two-time Packers Pro Bowler Larry McCarren (color) calling the action. The duo enters its 14th season of broadcasts together across the Packers Radio Network, which covers 44 markets in six states. – Dial Global Sports radio will air the game across the country. Kevin Harlan (play-by-play) and Dan Fouts (analyst) will call the action with Hub Arkush reporting from the sidelines. Scott Graham hosts pregame and halftime shows. – Univision Radio will broadcast the game in Spanish to a national audience, with Rafael Hernandez Brito (play-by-play) and Raul Striker Jr. (color) calling the action. – Listen to live radio broadcasts online in premium sound quality with NFL Audio Pass. – For international fans: Watch NFL games, including the playoffs and Super Bowl, live or on-demand online in HD with NFL Game Pass. The information above is contained within this week’s Dope Sheet. For even more information on Saturday’s game, check out the Dope Sheet. – FOX Sports, now in its 19th season as an NFL network television partner, will broadcast the game to the majority of the country. – Play-by-play man Joe Buck and color analyst Troy Aikman will have the call from the broadcast booth with Pam Oliver reporting from the sidelines. – Dial Global Sports radio will air the game across the country. Kevin Kugler (play-by-play) and Mark Malone (analyst) will call the action, with Scott Graham hosting pregame and halftime shows. – The broadcast is also available on Sirius Satellite Radio (Channel 104) as part of the network’s NFL Sunday Drive. – DIRECTV subscribers can watch the game in HD on Channel 706. The information above is contained within this week’s Dope Sheet. For even more information on Sunday’s game, check out the Dope Sheet. – The Packers make their second of two appearances this season on CBS. The network will air the contest to a regional audience. – Play-by-play man Greg Gumbel and color analyst Dan Dierdorf will have the call from the broadcast booth. – The broadcast is also available on Sirius Satellite Radio (Channel 91) as part of the network’s NFL Sunday Drive. – DIRECTV subscribers can watch the game in HD on Channel 710. – FOX Sports, now in its 19th season as an NFL network television partner, will broadcast the game to a regional audience. – Sports USA radio will air the game across the country. Larry Kahn (play-by-play) and Ross Tucker (analyst) will call the action with Troy West reporting from the sidelines. – The broadcast is also available on Sirius Satellite Radio (Channel 117) as part of the network’s NFL Sunday Drive. – DIRECTV subscribers can watch the game in HD on Channel 705. – Sports USA radio will air the game across the country. Adam Amin (play-by-play) and Ross Tucker (analyst) will call the action. – Dial Global Sports radio will air the game across the country. Kevin Kugler (play-by-play) and Mark Malone (analyst) will call the action and Scott Graham hosts the pregame and halftime shows. – For international fans: Watch NFL games, including the playoffs and Super Bowl, live or on-demand online in HD with NFL Game Pass (UK Blackouts: This game is scheduled to be blacked out live in the United Kingdom and Republic of Ireland. These games will be available in the NFL Game Pass archives 24 hours after the conclusion of the television broadcast. Canada Blackouts: Regional Canadian blackouts: Ottawa, Toronto, SW Ontario, N Ontario, Winnipeg, Saskatchewan). – The broadcast is also available on Sirius Satellite Radio (Channel 92) as part of the network’s NFL Sunday Drive. – DIRECTV subscribers can watch the game in HD on Channel 704. 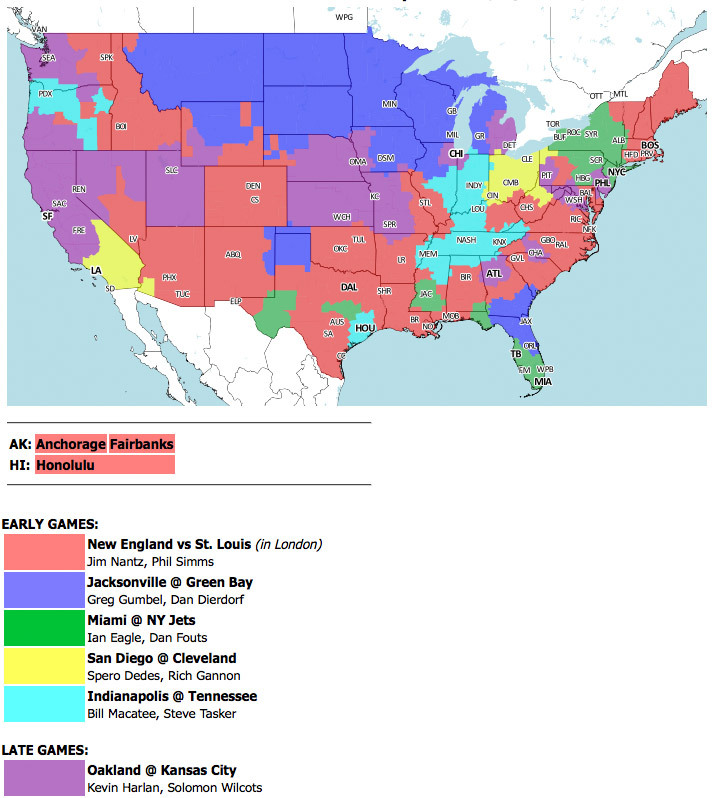 – The Packers make their first of two scheduled appearances this season on CBS. The network will air the contest to a regional audience. – DIRECTV subscribers can watch the game in HD on Channel 709. – For international fans: Watch NFL games, including the playoffs and Super Bowl, live or on-demand online in HD with NFL Game Pass (Regional Canadian blackouts: Winnipeg). – Play-by-play man Sam Rosen and color analyst Brian Billick will have the call from the broadcast booth with Laura Okmin reporting from the sidelines. – The broadcast is also available on Sirius Satellite Radio (Channel 138) as part of the network’s NFL Sunday Drive. – DIRECTV subscribers can watch the game in HD on Channel 707. – Packers fans are invited to bring the spirit of Green Bay to Indianapolis a day early with a free Packers Everywhere Pep Rally on Saturday, Oct. 6, from 6:30 to 7:30 p.m. EST, with doors opening at 4 p.m. EST. The festivities will take place at Rock Bottom, a restaurant and brewery in downtown Indianapolis, located at 10 W. Washington St. Click here for more information on the pep rally. – Play-by-play man Thom Brennaman and color analyst Brian Billick will have the call from the broadcast booth with Laura Okmin reporting from the sidelines. – The broadcast is also available on Sirius Satellite Radio (Channel 92, WTMJ feed) as part of the network’s NFL Sunday Drive. – For international fans: Watch NFL games, including the playoffs and Super Bowl, live or on-demand online in HD with NFL Game Pass. Not available in US, Mexico, US Territories.